It’s late in the Fall season here in the USA, so the water temperatures are dropping as we move closer to Winter. Seasoned anglers know that hair jigs catch more fish in cold water than standard silicone-skirted jigs. They are especially good at catching big smallmouth bass. So sit back and learn How to Tie a Wooly Bucktail Hair Jig, so you can put more fish in the boat this late fall season! The list of items used for the Wooly Bucktail Hair Jig is pretty short, the core of which is a small leadhead jig that’s had the lead collar cut off. We will include a complete list of the items at the end of this post. 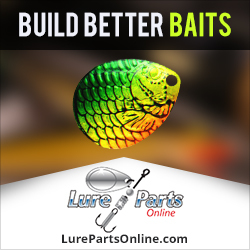 After securing your jighead in your vise, you’ll need to apply a light coat of brush-on super glue to the hook shank. This helps to keep the thread from sliding down the shank when the lure is finished. Next, you’ll apply some base wraps with your 210 Denier thread. After this, you’ll begin layering your bucktail on with your thread and bobbin. Be sure the bucktail covers the hook all the way around, not just on the top or the bottom. Your next step will be to use some crystal flash accents in the skirt, to give it some highlights. The Krystal Flash gets doubled over, which makes it impossible for it to be pulled out later on when fishing with it. You’ll now be adding some deer belly hair. 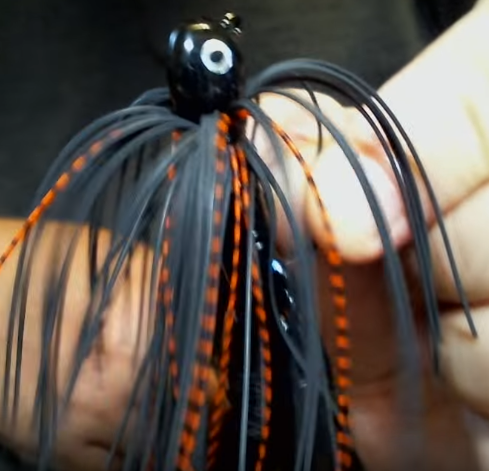 This gives the jig a sort of “head” that completely changes the jig’s profile. The dear hair is tied onto the jig using a zig-zag type of motion, which prevents the hair from getting flattened out as the thread is wrapped around it. 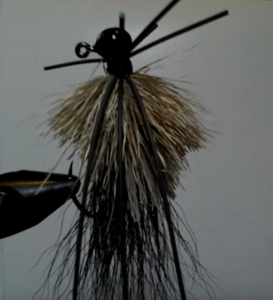 As with the initial layers of bucktail, be sure the deer hair covers all around the jig evenly. Scissors will be used to trim the deer belly hair on a taper. But be sure not to accidentally cut the bucktail when doing this. The abundance of deer belly hair causes the jig to fall very slowly, making it very hard for the bass to ignore as it falls into its habitat. This means that the vast majority of bites you get will be as the jig drops to the bottom. The final piece of this jig is some living rubber strands that you’ll add. Living rubber works much better in cold water than silicone skirt material. So it’s important not to use silicone for this step. You’ll be using 6 strands for this jig. Give the rubber legs a nice collar to hold it all in place, and then whip finish it to complete the tying steps. The final step is to apply some head cement. There you have it! You’ve learned How to Tie a Wooly Bucktail Hair Jig! Now go catch some fish with it! This entry was posted in Making Your Own Jigs and tagged How to Tie a Smallmouth Bucktail Hair Jig, How to Tie a Wooly Bucktail Hair Jig, How to Tie a Wooly Bucktail Jig, How to Tie a Wooly Hair Jig on November 22, 2018 by Lure Parts Online. Today’s blog post will show you How to Make Holographic 3D Eyes for Fishing Lures, step by step. It’s not a complicated process, but it does have a few steps involved. 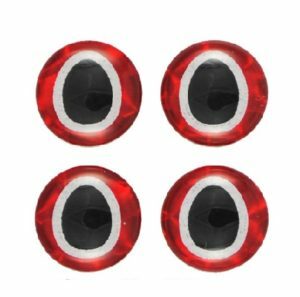 Keep in mind that there are many different ways to Make Holographic 3D Eyes for Fishing Lures, so the method covered here is just one of them. But this particular method works well and can be completed by just about anyone with the right tools, the right components to work with and a a little bit of their time. The first step you’ll need to take is to print some eyes on adhesive backed decal paper. Then you will need to cut the printed eyes into smaller sheets of paper to make them easier to work with. The smaller sheets are then placed in water for a short time (40-50 seconds), and then placed onto holographic foil. Once secured onto the foil, each individual eye is stamped out using a leather hole punch. The individual eyes are then placed onto screw heads with a bit of glue, allowing a small amount of epoxy to be placed onto the top of each one. 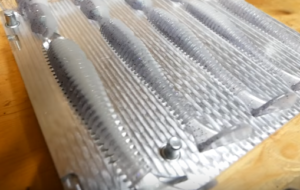 A heat gun is then used to remove any air bubbles that might have formed in the epoxy. Let the epoxy cure until fully hardened. Then, removes the eyes from the drying rack, peel and enjoy! For this process you’ll need a few things. We’ve listed everything below, underneath the video. This entry was posted in Making Lure Eyes and tagged How to Make Holographic 3D Eyes, How to Make Holographic 3D Eyes for Fishing Lures, How to Make Holographic 3D Fishing Lure Eyes, How to Make Holographic 3D Lure Eyes, How to Make Homemade Holographic 3D Eyes, How to Make Homemade Holographic 3D Lure Eyes on June 27, 2018 by Lure Parts Online.